On June 27th, 2016 I have defended and obtained my Professorial Habilitation (Habilitation à Diriger des Recherches, HDR, in French). The HDR title has been bestowed by the Toulouse Institute of Technology (Institut National Polytechnique de Toulouse, INPT). The defense took place at LAAS-CNRS in Toulouse. 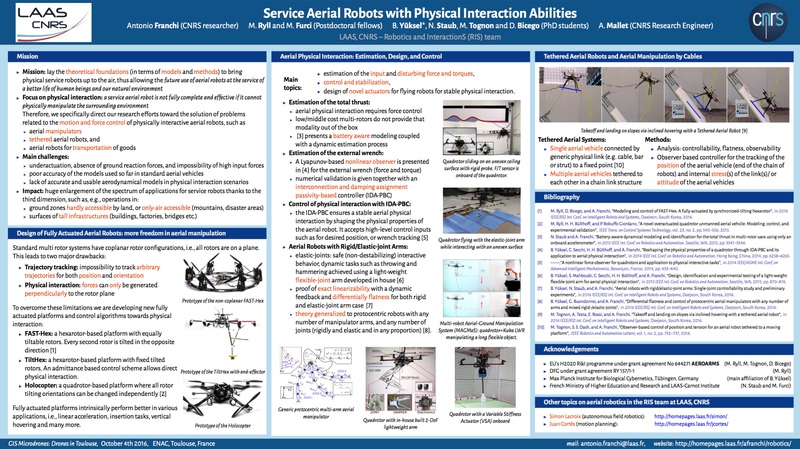 The title of my HDR thesis is " Methods for the Control of Mobile Robots with applications to Multi-robot systems, Shared control and Aerial Robotics " Attached below you can find the pdf of the HDR Thesis and the pdf (without videos) of the HDR defense slides.